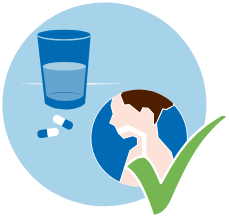 Less systemic exposurecompared to tablets and suitable for a wide range of adults. *Euromonitor International Limited; in terms of retail sales value in 2017, based on the custom research conducted in March-April 2018 in the countries that account for more than 70% share of the global topical analgesics/anaesthetic market in 2017. 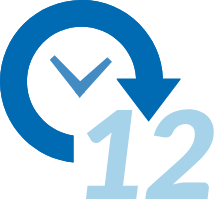 Salonpas is the world’s No.1 brand of OTC topical analgesics in patch category. *Source: Euromonitor International Limited; in terms of retail sales value in 2017, based on the custom research conducted in March-April 2018 in the countries that account for more than 70% share of the global topical analgesics/anaesthetic market in 2017. This year on Salonpas day, we exhibited at This Morning Live. Salonpas® Pain Relief Patch, Medicated Plaster 105mg/31.5mg, Methyl Salicylate/Levomenthol is specifically designed for the symptomatic relief of pain of muscles and joints associated with strains and sprains. 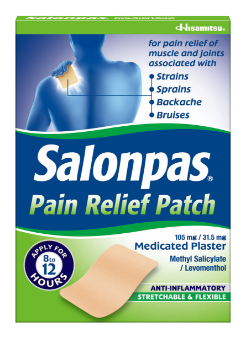 Salonpas® Pain Relief Patch is available over the counter from your pharmacist. Always read the label. © 2015 Hisamitsu UK Limited. A subsidiary of Hisamitsu Pharmaceutical Co., Inc. All information applies to UK products only.